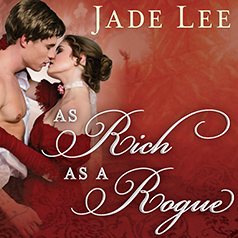 Third in the saucy, vibrant Rakes & Rogues Regency romance series from USA Today bestselling author Jade Lee. Mari Powel's fiery Welsh temper is up. Peter Norwood, Lord Whitly, is back in town after six years romping around India making his fortune. Mari blames him for her social downfall and has spent all this time clawing her way back into the town's good graces. How dare he show up on his first day back and publicly embroil her in a bet involving long-awaited apologies, illicit kisses, and Lady Illston's unruly parakeet? Mari is outraged, and is going to show him—and everyone else—what she's made of. Little does she know, the unrepentant Lord Whitly has been dreaming of her all this time. Now he'll do anything to win the wager—along with Mari's heart.